My parents recently went to South Carolina and brought me back some freshly harvested sweet potatoes. If you have never had any really fresh sweet potatoes, you need to add them to your list of things to try because they really are much better than ones that you find in most grocery stores. I love sweet potato fries, so I had to make some with my fresh sweet potatoes. 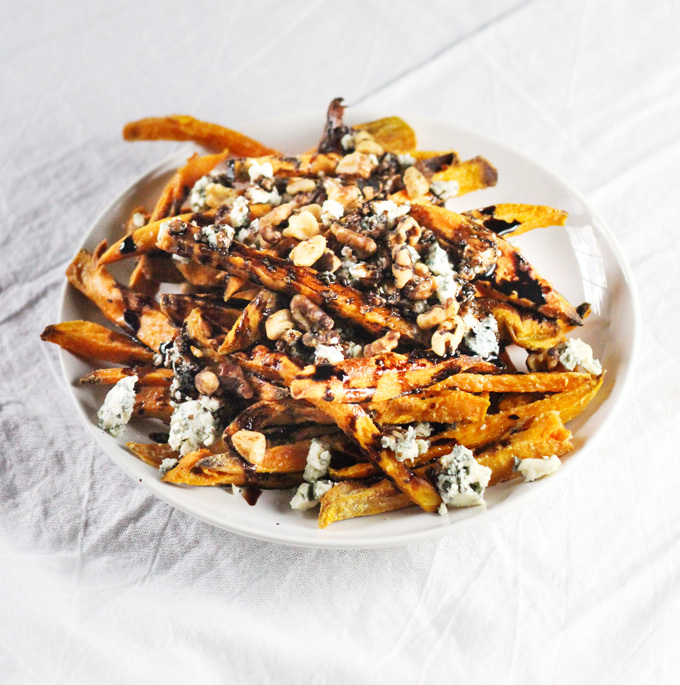 Mine are baked sweet potato fries to keep the calories down, but you could also fry them. 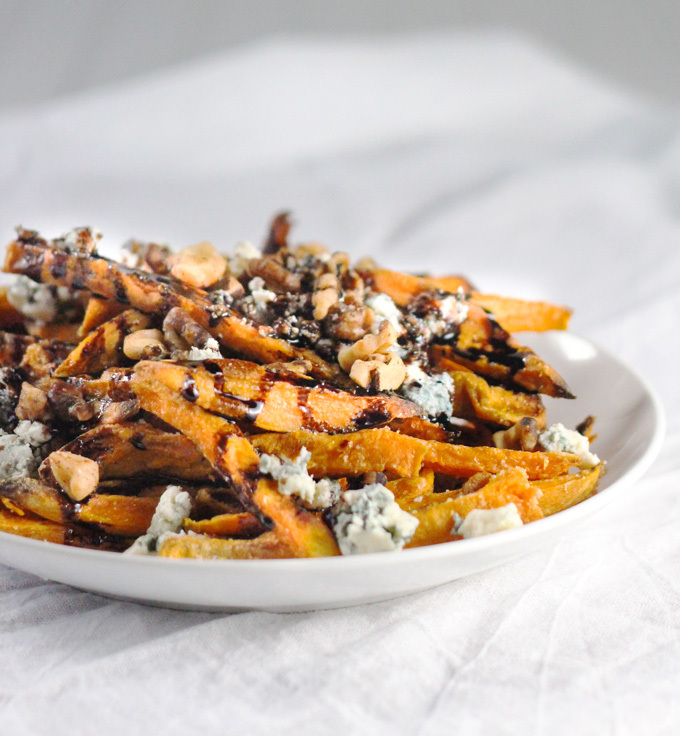 And, you could even top frozen sweet potato fries with the blue cheese, walnuts, and balsamic reduction if you don’t have the time to make your own. It would still be delicious because, trust me, this flavor combination is just decadent fresh sweet potatoes, or not. 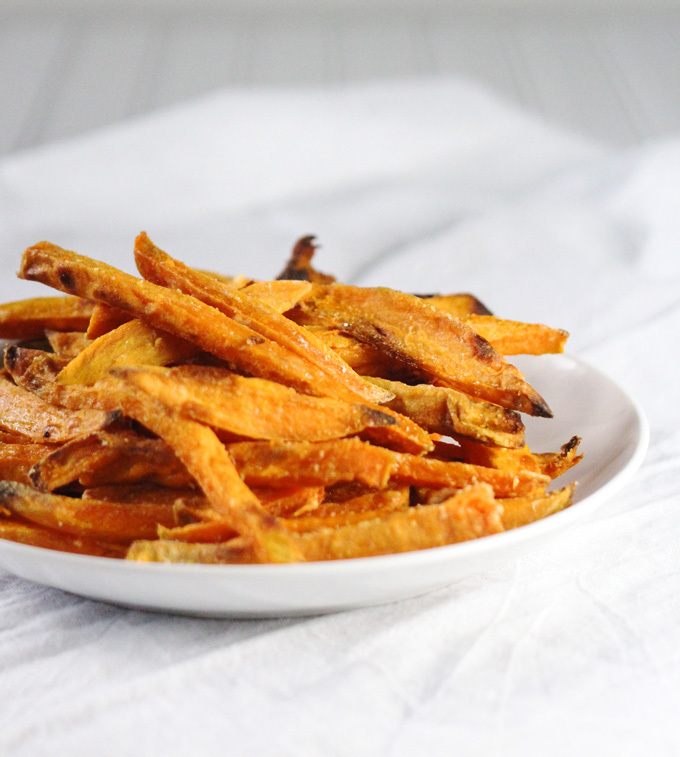 The sweet potato fries are also really good right by themselves or with your favorite seasoning sprinkled on top. I am writing this recipe for two potatoes, which serves two people, but you can easily half it, double it, triple it, etc. If you have not already toasted the walnuts, do so now. Set aside until potatoes are done. Place the vinegar in a small sauce pan and cook over medium heat until reduced to half. Set aside until potatoes are done. Place cornstarch and salt in a large zipper back, add the sweet potatoes and shake well until all are coated. Spray the foil lined baking sheet liberally with olive oil. Place the sweet potatoes on the foil in a single layer. Spray the sweet potatoes liberally with olive oil. Remove from the oven and turn the sweet potatoes slices over. Spray with more olive oil. Return to the oven and continue to bake until brown and cooked through. Mine took 17 minutes, but this is highly dependent upon how thick you slice your sweet potatoes. Place potatoes on plates to serve and top with balsamic reduction, blue cheese, and walnuts.